Steely sunburst amber color. Aromas and flavors of berry soda, lemonade, and lemon candy with a supple, vibrant, effervescent, fruity medium-to-full body and a smooth, medium-length finish that presents notes of lemon soda and sherbet, honeyed fruitcake, and mango with lemon verbena finish. A super fruity, easy drinking summer sipper; try as cocktail with gin. Bottom Line: A super fruity, easy drinking summer sipper; try as cocktail with gin. 87 • Bandero Blanco Tequila 40% (Mexico) $45.00. 93 • Bogart’s Gin 45% (USA) $35.00. 85 • Bogart’s White Rum 40% (USA) $26.00. 86 • Bogart’s Irish Whiskey 40% (Ireland) $32.00. 89 • Graffiti 2016 Beneventano, Falanghina, Italy 13% (Italy) $18.00. 84 • Graffiti NV Spumante, Falanghina, Italy 12% (Italy) $23.00. 90 • Graffiti NV Blanc de Noirs Brut, India 12% (India) $23.00. 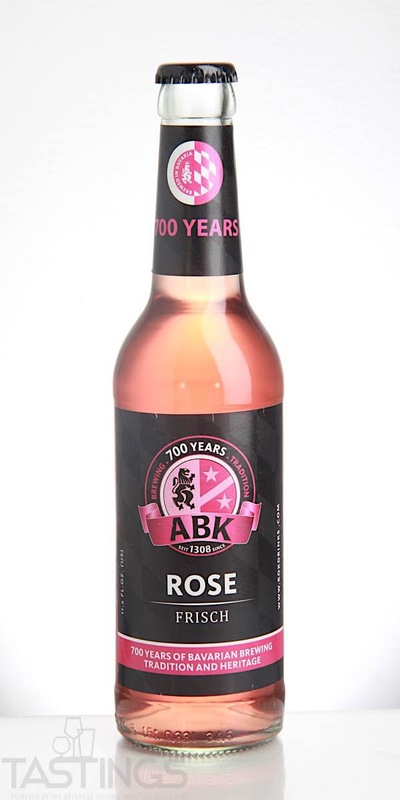 ABK Rose Frisch rating was calculated by tastings.com to be 88 points out of 100 on 6/8/2018. Please note that MSRP may have changed since the date of our review.